√ A Warm and Patient Teacher - Brian focuses on listening to the student and helps them to achieve their personal music goals at their own pace and in a way that works for them. √ Private Studio Designed for Learning - Unlike many lesson facilities that cram a bunch of teachers into closet sized rooms lining a hallway where everyone hears the lesson next door, Rivers music provides a spacious studio that is a focused learning environment with room for students and parents. Also, internet access, recording play back equipment, and printer integrates technology to support student learning. 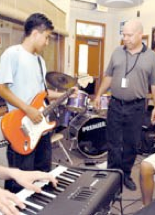 √ Real Results - Brian's students develop the skills that allow them to fully enjoy their love of music. Brian students range from amateurs to professional award winning musicians, but what they all have in common is an enjoyment of music making. √ Tailored Lessons - Brian is an expert in a variety of styles and instruments. He does not teach one style, or use the same approach with each student, he tailors the lessons to help you reach your goals and uses your previous musical experience with other instruments to support your learning. If you looking for guitar lessons for yourself or child, you have come to the right place. My goal is to help students develop a life-long love for music making, either an amateur, or professional. I offer the very best in quality instruction in an excellent facility that is spacious and quiet. I teach guitar, bass, songwriting, computer recording, music theory, and will work with any instrumentalist on improvising or general musicianship. Your satisfaction is my goal. The “testimonials” at the bottom of this page say it all! Rivers Music is a private lesson studio in the Clifton neighborhood of Cincinnati. The instructor, Brian Rivers has years of experience as both a private and classroom music instructor. Brian takes pride in providing top quality music instruction in a warm and relaxed manner. Brian has a strong commitment to musical excellence, education, and his students. He tailors the lessons and methods to the individual student; child to adult, beginner to advanced. He plays a wide variety of styles, Rock, Jazz, Blues, Country, Folk, Reggae, Finger Style, and Latin. Brian has appeared on many recordings and performed at numerous music festivals throughout the United States. The facility and teaching environment contributes to the quality of instruction. It includes a library of guitars, books, handouts, recording equipment, and internet. It provides a quiet and focused environment for learning. The studio waiting area has complimentary WiFi and the Clifton - Ludlow business district is a short walk away! In the Clifton neighborhood of Cincinnati, north of the Ludlow business district. Fill out the Student Registration and Teacher - Student Agreement form below and be sure to scroll to the very bottom and hit submit to get started learning to play! Before enrolling in courses at Brian Rivers Music, LLC, all students must first complete the registration process. This is a legally binding contract and must be entered into by an adult, or if Student is a minor, this Agreement is to be entered into by a responsible parent or guardian on behalf of the Student. Under all circumstances, Student must abide by and agree to all of Teacher’s policies and procedures. Some of the critical policies and procedures are outlined below. Teacher agrees to provide high quality, personalized instruction based on the needs and goals of the student. Teacher will communicate in a clear and timely manner and respond to Student questions and concerns and provide feedback regarding Student learning. Teacher will provide a clean and comfortable learning environment that includes seating, music stands, and amplification, as needed, cables, music playback system, Internet, printer and any other items to facilitate Student learning. Students should plan on spending a minimum of 20 - 30 minutes a day, five days a week practicing to get the most from their lessons. Your level of success depends on your individual, at home practice! Students shall be responsible for bringing: music, instrument (in good working order), pencil, flash drive and a spiral three-ring notebook with some paper and plastic sleeves to write down notes and file handouts. Students may use a video/audio device (smart phone etc.) to record all or part of a lesson for their personal use. Occasionally Students may be asked to buy method books, sheet music, or other small accessories for use in learning or playing their instrument. The costs of any additional items are not included with the instructional fees. Lessons are generally $30.00/ half-hour private lesson. Payments can be made by cash, check, credit card or e-check. Checks should be payable to: Brian Rivers Music, LLC. Lessons that are scheduled before 3:00 are ideal for students who need the flexibility with scheduling. These lessons are scheduled as needed and subject to the term minimum payment. Payment is due 10 days before the start of a session term. A session payment plan is available. Late registrations and enrollments after the start of the session will be prorated. Lessons are scheduled at the same time every week. Unless Students have a scheduled make-up lesson there should be no variations. Online lessons (Skype/FaceTime) are available in the case of bad weather or other issues that prevent personally lesson attending a lesson. There are no credits or refunds for missed lessons. For lessons scheduled at 3:00 pm or later, you are allowed (2) two make-up lessons per session, subject to teacher availability and with three days notice. Students who do not cancel lessons with three days notice or simply "no-show" do not qualify for potential make-up lessons. If a student knows they will miss a lesson please call or email and let teacher know as soon as possible. Lessons that are regularly scheduled before 3:00pm can be cancelled or rescheduled without penalty (subject to the term minimum) by giving advanced notice 24 hours or more in advance. Students who do not cancel or reschedule lessons 24 hours in advance are billed at full price. Weekly students are given "Schedule Priority" based on the number and length of weekly lessons during the summer term. After you and other weekly students pick regular weekly lesson times, you will be able to adjust your schedule, you can skips weeks, come multiple times during the week, come for an hour or two etc. based on availability. If you know your summer schedule, make your schedule requests in the additional information session at the bottom of the registration form to ensure the greatest likelihood of being scheduled into those specific time requests. Lessons can be rescheduled without penalty as long as they are rescheduled within the term by giving advanced notice 72 hours or more in advance. Students who do not cancel or reschedule lessons 72 hours in advance are billed at full price and not eligible for scheduled make-up lessons. For lessons that are scheduled at 3:00 pm or later during the fall and spring sessions or for lessons scheduled as "level 1 or 2 schedule priority" students for the summer session, the tuition is not refundable unless 1) classes are cancelled by Brian Rivers Music, LLC or 2) if Brian Rivers Music, LLC is notified in writing or by email that there has been a significant change in the employment or health status of the Student or guardian which case the unused remaining prorated portion or the term will be refunded in full. Notwithstanding anything herein to the contrary, all refunds remain at the sole discretion of Teacher. For lessons that are scheduled before 3:00pm during the fall and spring sessions or for lessons that are schedule as a "level 3 priority" during the summer session, classes can be cancelled and refunded or rescheduled without penalty by giving notice 24 hours or more in advance. Students who do not cancel or reschedule lessons 24 hours in advance are billed at full price. Parents of Students are welcome to observe lessons and it is recommended that parents of Students 6-9 years old observe the lessons to be able to help guide at home practice. Parents and Students may wait in the waiting area, and may wait with other children. At no time shall any child or sibling of a Student be left unattended in the studio or waiting area. There are a number of toys and magazines in the waiting area for children and adults who are waiting for Students. However, it is important to not make excessive noise, as that can be distracting to the student currently attending a lesson. Parking is available on the street in front of Brian Rivers Music, LLC. Please do not block the driveway or neighbor's driveway. For brief, critical communications such as lesson cancellation, where sending an email or dropping a letter in the mail is not appropriate, text messages can be sent to 513-335-0624. Please be sure to include Student’s name in the text message! Too often all we can see is a phone number and we have no way of knowing who is sending the message. Students participating in music instruction at Brian Rivers Music, LLC do so at their own risk. Student agrees to indemnify and hold harmless Teacher from all claims, losses, expenses, fees, including attorney fees, costs, and judgments that may be asserted against Teacher that result from participating in music instruction through Brian Rivers Music, LLC. Student agrees to further indemnify and hold Teacher harmless from any liability, loss, damage or expense, including legal fees, arising out of the negligent performance of either party’s respective obligations under this agreement. Teacher shall not be liable for any injury sustained while on the premises, nor be held responsible for any medical expenses incurred as a result of participation in music instruction through Brian Rivers Music, LLC. Student work and participation in music instruction courses at Brian Rivers Music, LLC and at performance events sponsored by Brian Rivers Music, LLC may be photographed or recorded in either audio or video format. By participating in these classes or events, Student agrees that Teacher may use any photographs, videos, artwork, or any other materials created while Student participates in our programs for publicity and advertising purposes, without any further compensation to Student or any other third party. In using any images or recording, all minor participant names will not be included without advanced permission form the parent or guardian. If a dispute arises under this Agreement, and if the dispute cannot be resolved through good faith negotiation, the parties agree first to try to resolve the dispute with the help of a mutually agreed upon mediator. The parties will share any mediation costs and fees other than attorney fees equally. If it is impossible to arrive at a mutually satisfactory solution within a reasonable time, the parties agree to submit the dispute to a court of competent jurisdiction in the city of Cincinnati, Hamilton County, Ohio. This Agreement shall be governed by and construed under the laws of the State of Ohio. If any provision of this Agreement is held in whole or in part to be unenforceable for any reason, the remainder of that provision and of the entire Agreement will be severable and remain in effect. If any legal action or other proceeding is commenced to enforce or interpret any provision of, or otherwise relating to, this Agreement, the losing party shall pay the prevailing party’s actual expenses incurred in the investigation of any claim leading to the proceeding, preparation for and participation in the proceeding. This Agreement contains the entire agreement of the parties. No other agreement, statement, or promise made on or prior to the effective date of this agreement will be binding on the parties. By completing the registration for classes, you, as Student, are signing and agreeing to this Student Teacher Agreement. Thank you for enrolling in our music instruction program! Your enrollment confirmation email will include a copy of this form and the Teacher Student Agreement. Please keep up with Brian Rivers and Brian Rivers Music, LLC on his main websites: www.brianrivers.com or www.riversmusic.com where you can see the schedule of events, and news. Payment is due 10 days advance of start of a session to secure your weekly time slot. You must ﻿also complete the registration form asap to get the best schedule placement. Payments can be made by cash, check, credit card or e-check. Checks should be payable to: Rivers Music, LLC. 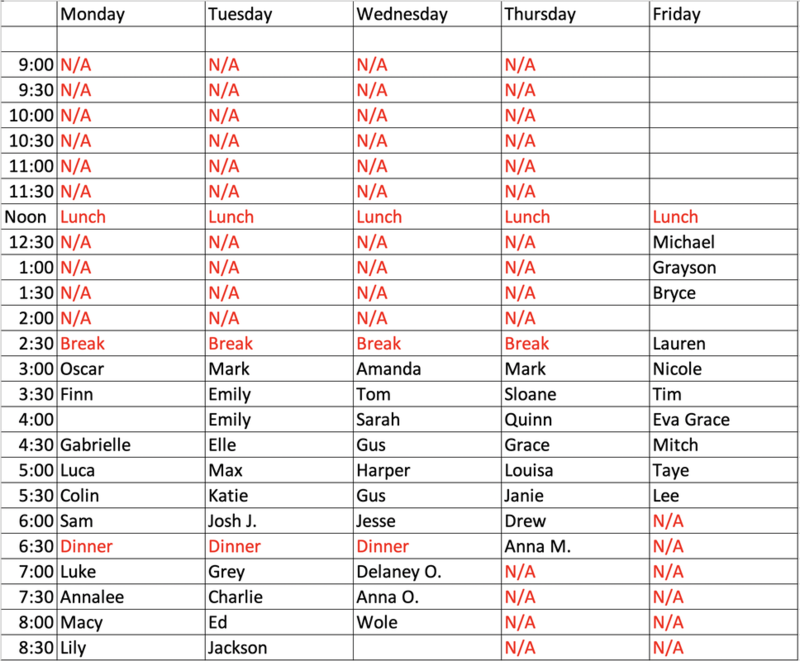 ​The Rivers Music Weekly/Daily Schedule below (grey) is mainly for the benefit of my current students so they can see when there might be openings for make-up lessons. The calendar defaults to the current week, so please be sure to use the arrows in the blue buttons to scroll to the correct week. If none of the open times work for you, I recommend you contact me to get your name the waiting list! I will contact people from the waiting list if and when openings become available. During the registration period for the next session, current students get priority, then returning students who took a break, then waiting list students. Once all those students have had a chance to get on the schedule, I open enrollment to new students not on the waiting list. A: Most any age is OK, as long as children have basic motor skills and can hold the instrument. Q: What do lessons cost? A: See the "Pricing Information" section above. Q: Do I get a refund for missed lessons? A: See the "Rates and Policies" section above. A: In my home studio, 471 Wood Ave. In the Clifton Gaslight neighborhood of Cincinnati OH. Q: Do you teach home-schooled students? A: Certainly. I welcome all students. Q: I am an adult with not much music background. Can you start me in lessons? A: Absolutely. You are never too old to learn, even if you have never had music instruction before. Adults usually learn music concepts quickly, the real challenge is finding the time to practice, not age. Q: I am a college student with a changing schedule, can I change lesson times when needed? A: Absolutely. If you are a college student and can make a lesson time before 3:30, it is not a problem to change lesson times if needed. Q: I got bored with music lessons when I was young. Can you teach me the kind of music I want to play and sing? A: I welcome the opportunity to work with students with a wide range of musical tastes! Q: I am stay at home parent, can I change lesson times when needed if my child is sick, or it's a school holiday? A: Absolutely. If you have a regular lesson time before 3:30, it is not a problem to change lesson times if needed. Q: Does there have to be an instrument at home to use for practice? A: Yes — you must have an instrument to practice on between lessons. Q: Do you rent or sell instruments etc.? A: No, I will be happy to suggest a music retailer. (See the home page or side bar here) This is what they do, and they do it well. Rivers Music is not a retail music store. A: Weekly private lessons can be 30 or 60 minutes . Q: What is better, 30 or 60 minute lessons? A: It all depends on the student. If the student has the ability to focus for 60 minutes, then the 60 minute lesson is by far the best value because the ratio of instructional time to transition/set-up time is much better. The 60 minute lesson is also good for the student that simply needs more time or guidance. It also allows for a deeper exploration of a new concept. For most students who often have limited practice time, the 30 minute lesson is more than enough time to keep a student busy all week. Q: When can lessons be taken? A: Weekdays during the day as well as some evenings. Q: Do you give lessons in people’s homes? Q: Do you offer group lessons? Q: How can I help my child learn? A: Be supportive. Even if you are not musically inclined, you should encourage your child’s efforts. Find ways to praise your child and give occasional rewards. Do not threaten or use practice time as a punishment. Such actions make music study unpleasant, unrewarding, and — almost always — unsuccessful. Encourage regular practice sessions. No one can "cram" for music lessons. it’s best to have regular, daily practice sessions. Someone who doesn’t practice will not learn the material. Practicing each day will guarantee success. Quality practice time is important. It is okay to break up the practice into smaller periods of time for students who have a hard time practicing for longer periods of time. Some children profit from two or three (shorter) practice sessions a day. Q: Should I attend my child’s lessons? A: Parents are always welcome to attend their child’s lessons. However, doing so sometimes inhibits the child. This is especially true with adolescents. On the other hand, young children are sometimes more comfortable if a parent is present. If you do attend your child’s lessons, please let the teacher do the teaching. Be attentive. • "I have been playing violin, piano, and guitar since I was 10-11 years old. 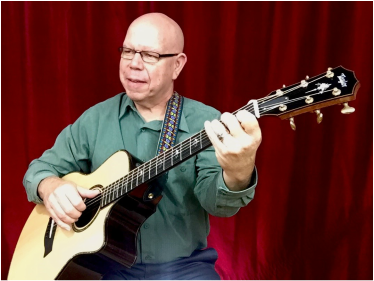 As a professional musician/music therapist, I have the great opportunity and joy to play music everyday in some capacity (area orchestras,a songwriter's group, a Celtic trio, in music therapy sessions and in churches). I feel fairly proficient on violin and piano but sought out Brian Rivers to deepen my understanding of the guitar with the goal of becoming a better rhythm player and a better songwriter. To date, I have taken 20 lessons with Brian Rivers. I am hooked. I thought with my experience and background, that my approach to music/ music theory was adequate, confident and secure. I know my scales, keys, chord voicings,etc and use them regularly... or so I thought, until I met Brian. It has been an honor to study with Brian Rivers, a brilliant soul. Brian's teaching approach is masterful. He is helping me unlock the secrets of the guitar with his unique methods, handouts, and demonstrations. Moreover, his teaching style is kind, patient, serious, humorous, and he shows genuine interest in my abilities to learn. Brian is excellent at teaching and helping me expand upon a single concept, and at showing me how to use it in multiple ways (scale patterns and chord shapes to be specific). I have always loved playing music, but now I find myself especially craving the guitar. Needless to say, not much housework has gotten done since I started guitar lessons, as my guitar calls to me. Got to practice. Got a lesson." • "Brian Rivers is my first music teacher. I have learned so much from him and always love going to my lessons. Sometimes when we get tired of working in the workbook I get to pick out a song or two that I like which makes my lessons more fun and interesting. My lessons are so much fun that when they are over, it feels like I just started and I don't want them to be over. Brian Rivers may be one of the best teachers I have ever had. • "We found out about Mr. Rivers by sheer luck and I am still thanking the Internet for coming up with his name by googling "guitar lesson Cincinnati". Our son had been struggling with language arts and a friend recommended to start the guitar for a fun way for the brain to learn another "language". It's been more then a year and simply great. Mr. Rivers has a wonderful demeanor that puts even nervous children at ease and he never fails to get them smiling when they struggle through a piece. He teaches the children to take pride in their achievements but also that achievements need to be worked for. When he asks the kids "What do you do after you practice?" they love to yell back "Practice some more, Sir!" Mr. Rivers is truly a world class teacher and we feel lucky that his path brought him to Cincinnati. Thank you, Mr. Rivers!! • "Brian Rivers establishes great rapport with his students through his humor and warm relational skills. He truly INSPIRES them to love music and to work hard to develop their skills. My son (Elias, age 11) asked for guitar lessons from Brian as his birthday present after hearing Brian play and hearing testimonies from other students. Elias and I both still feel that those lessons from Brian were the best gift he's received. Brian gave him skills that built his self-esteem and inspired him to practice lots and to LOVE playing guitar. I am deeply grateful to Brian for the contribution that he made to my son's personal development and to his development as a musician. We recommend him most enthusiastically!" Lonna Hampton, mother in Davis, California, where many of us are mourning the loss of the best music teacher ever! • I had the privilege of having Brian Rivers as a teacher for three years during middle school and high school. Let me just say, Rivers knew just about anything. You name it, he taught it. He was my orchestra conductor, songwriting and guitar instructor, CD project producer and everything musically in between. But most of all, Rivers showed great interest in every one of his students and worked with them specifically so that they could find ways to apply music to life. He taught me the importance of putting my heart into the music I played, and the importance of making it relatable to others, so that it could inspire and motivate. He put so much time and energy even to see just a small step towards improvement. I have truly learned to use music to make a difference everyday. • "I originally began taking Music Theory right out of high school and found it daunting and uninspiring, so I discontinued. Much later on in life, I came upon a listing for a class in Music Theory in the community college extension catalog taught by Brian Rivers. Having known Brian from his involvement in Mumbo Gumbo as well as throughout the local community, I felt encouraged to take another crack at this long-time desire. From the moment I stepped into his studio for each lesson, I felt inspired and encouraged, and had regained my confidence that I could learn this very complex system. He's everything you would want in a music teacher and more." • " I worked with Brian Rivers for more than ten years at Natomas Charter School Performing and Fine Arts Academy in Sacramento, California. We worked in adjoining classrooms for most of that time. I feel I have an in-depth knowledge of Brian’s musical and pedagogical abilities in the classroom working with students of all ages. He has an incredible depth of knowledge concerning such diverse kinds of music as jazz, world, folk, blues, country and pop. He knows the ins and outs of these genres including their performance techniques, history, and theory. He also has a vast knowledge concerning digital recording. His passion for music and learning transfers to his students, many of whom continue to pursue music after they take his classes. Brian’s commitment to students and student learning makes him an inspiration for educators. His ability to connect with students and meet them where they are is a critical part of his—and his students—success. • "Brian Rivers is an amazing musician and an even more amazing music teacher. I happily shared a stage with Brian Rivers for 10 years in the funky, California roots band Mumbo Gumbo. I enjoyed his playing, his versatility, his energy, and his fun factor so much on every gig. Brian has deep music knowledge. He is such a patient guy, he can make you glad you asked even the stupidest questions! His kindness and amp-side manner are wrapped around years of accumulated knowledge and skill. He is one of the teachers I modeled my own teaching practice after. I flat-out love him. • "The recordings Brian made of my string trio were the best of those we own. His generosity and expertise and skills should be apparent to those who work with him. His professionalism as a teacher, and his patience as a director were wonderful to see in an age where we need a pied piper to lead our children with joy and positive direction. I would recommend Brian Rivers as an instructor, director, performer or organizer in aspects relating to quality music activities." • " Mr. Rivers was an inspiration to many students who learned from him while teaching at Natomas Charter School, myself included. His obvious facility to play the guitar was the first thing that made me aspire to learn to play the guitar. Beyond that, he showed such an immense passion for playing that influenced my own love for playing. Mr. Rivers showed me how to be a true musician: both in technique, and in playing from the soul. I am immensely thankful that I had the opportunity of taking a class from such an amazing guitar teacher."